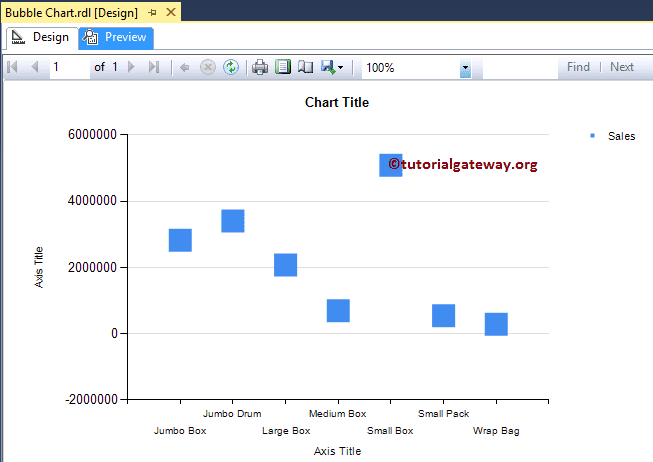 Bubble Chart in SSRS is used to display the data in circles. 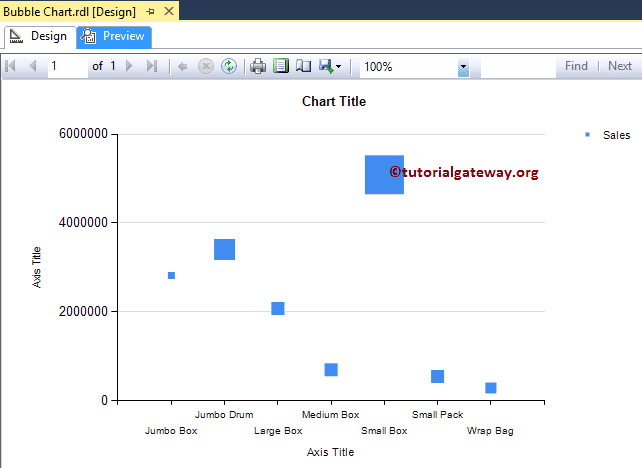 Bubble charts play a major role while creating Maps because we can use bubbles on top of the Map to display the profit or Sales by Postal code etc. 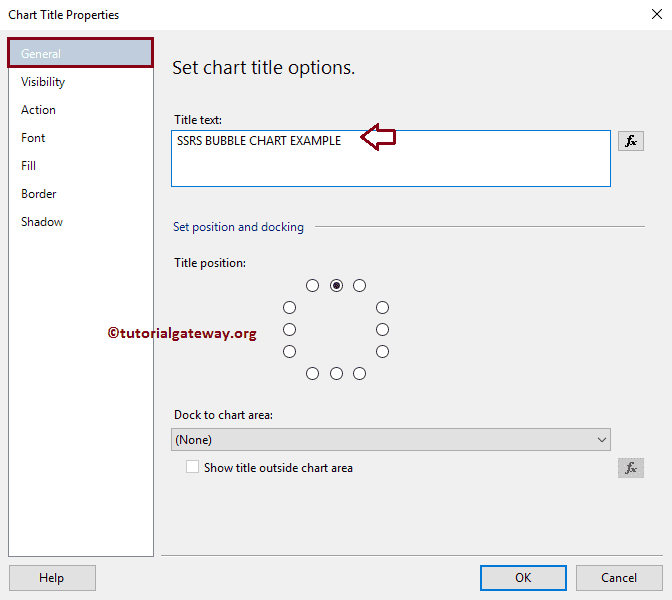 In this article, we will show you, How to make a Bubble Chart in SSRS, How to change the Chart Title, Legend Position, Legend Title, Font style, and chart type to 3D bubble chart in SQL Reporting Services with an example. In this example, we are going to create a Bubble Chart in SSRS to display the Sales Amount against the Product Container. 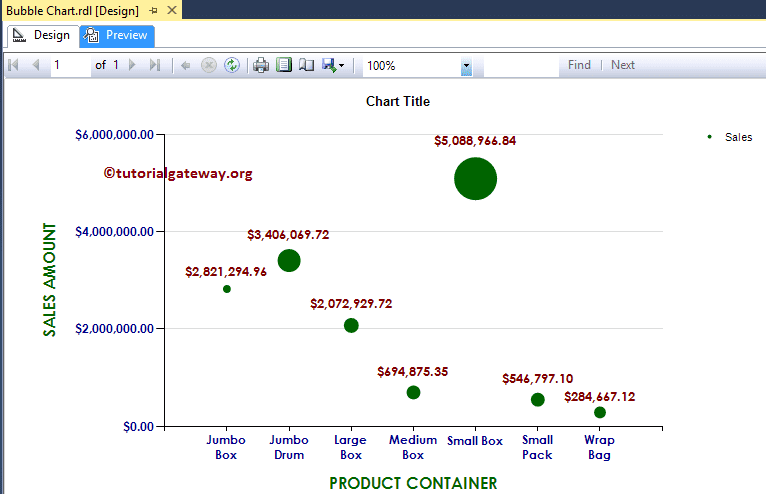 Below screenshot will show you the Data Source, and Dataset that we used for this Bubble Chart Report. 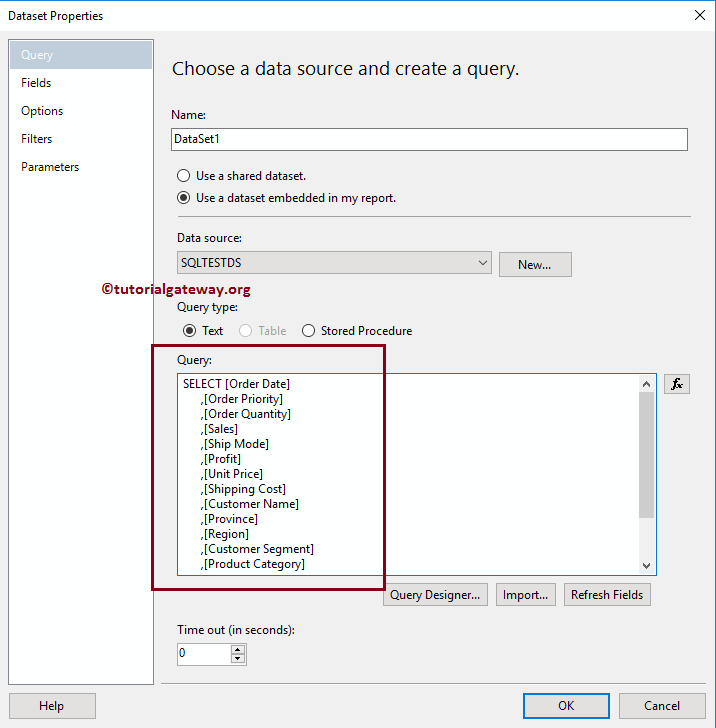 In SSRS report design, we can add a Bubble Chart by dragging the Chart property from the SSRS Toolbox to Design space, or we can simply right-click on the report designer to open the context menu. 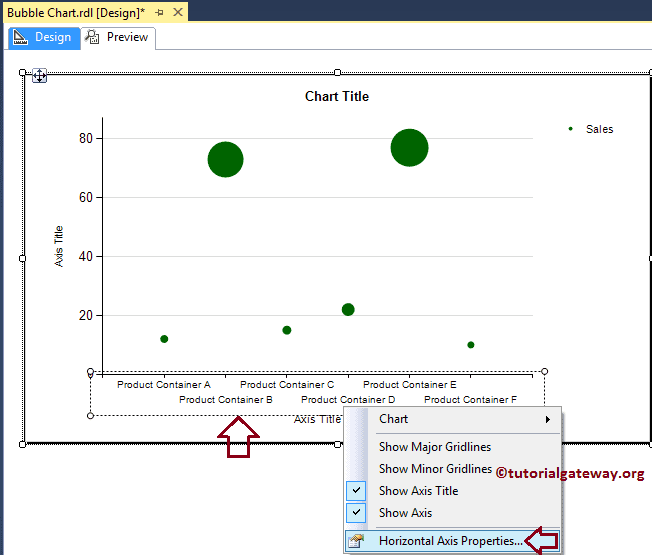 From the context menu, please select the Insert -> Chart option as we shown below. 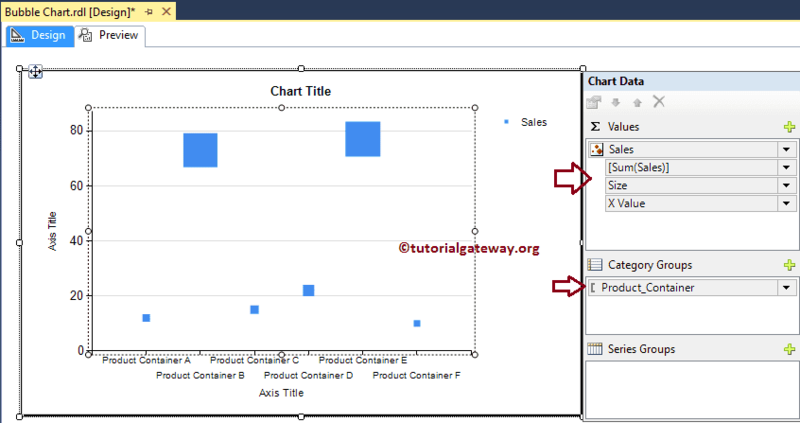 Once you select the Chart option, a new window called Select Chart Type will be opened to selectthe required chart from the available once. 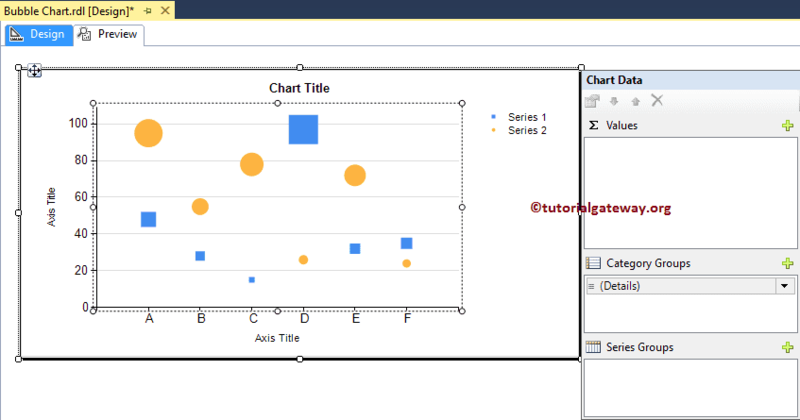 For this example, we are selecting a Bubble Chart as shown in below screenshot. 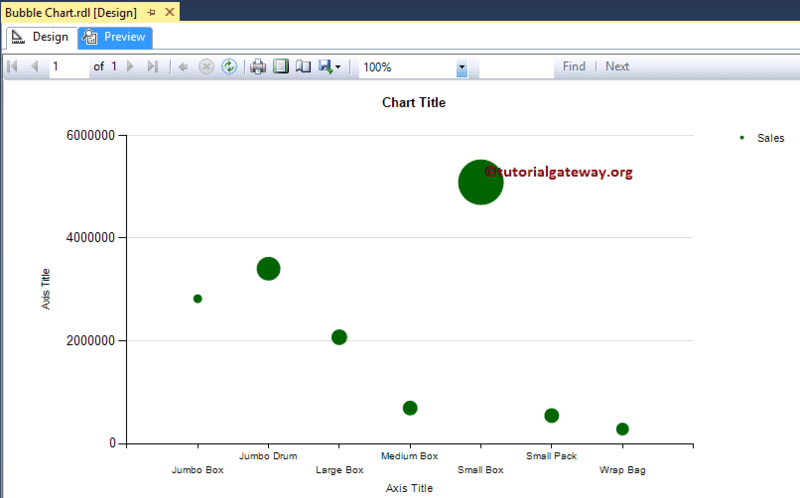 Once you click on Ok button, Bubble Chart will be displayed in the design region with dummy data. 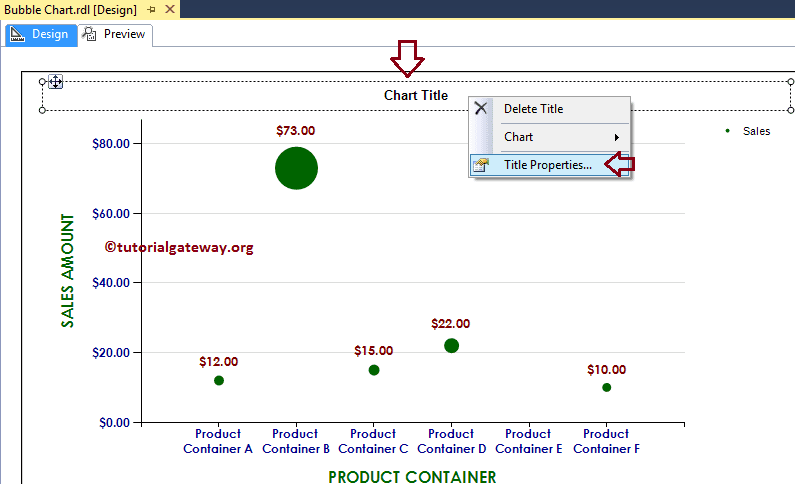 Category Group: Please specify the Column name on which you want to partition you the Bubble Chart. 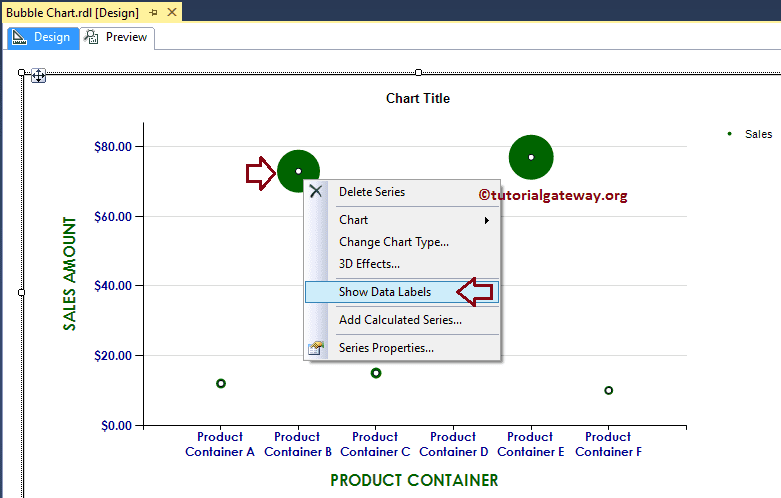 Drag and drop the Sales Metric column from data set to chart data values, and Product Container Dimension to category group. 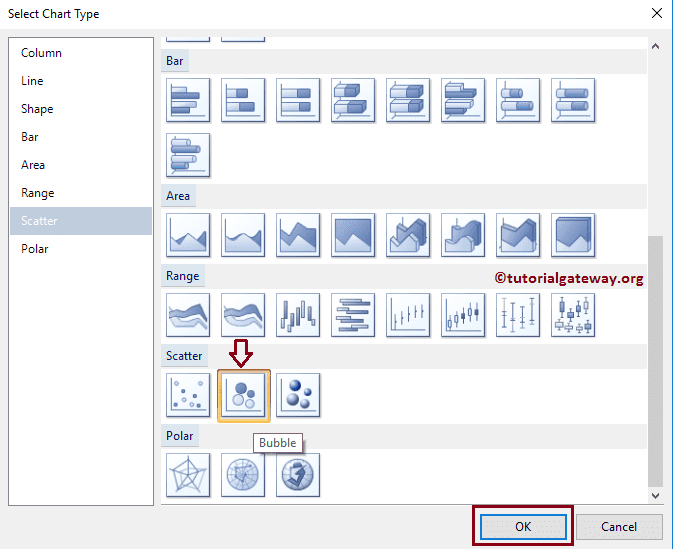 If you observe the above screenshot, It is providing perfect result but the size of the Markers (Square boxes) are in same. So, let me change the size based on the Profit dimension. 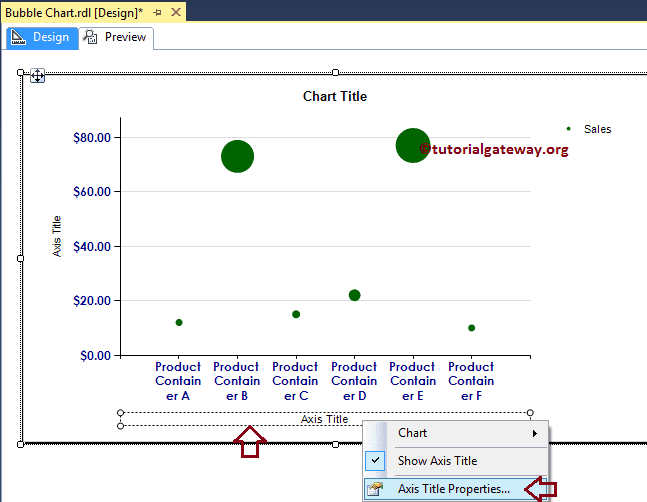 Though the above chart is displaying the required result, it is not displaying the bubbles. 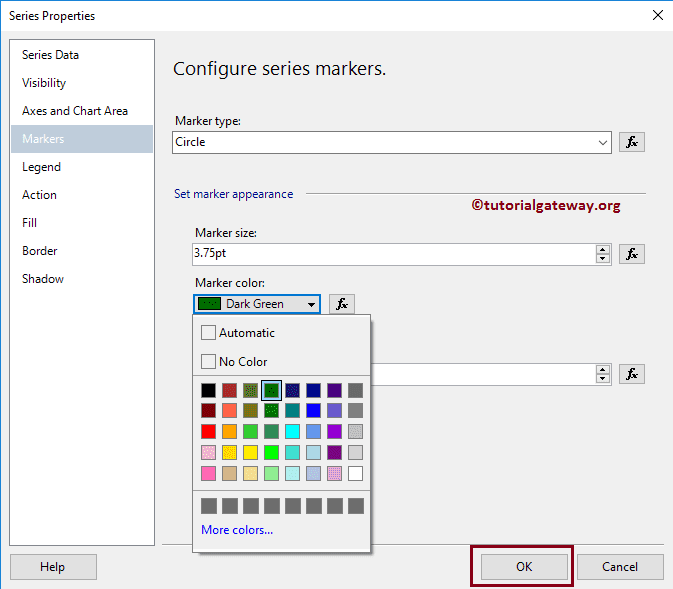 Right click on the Marker will open the context menu. 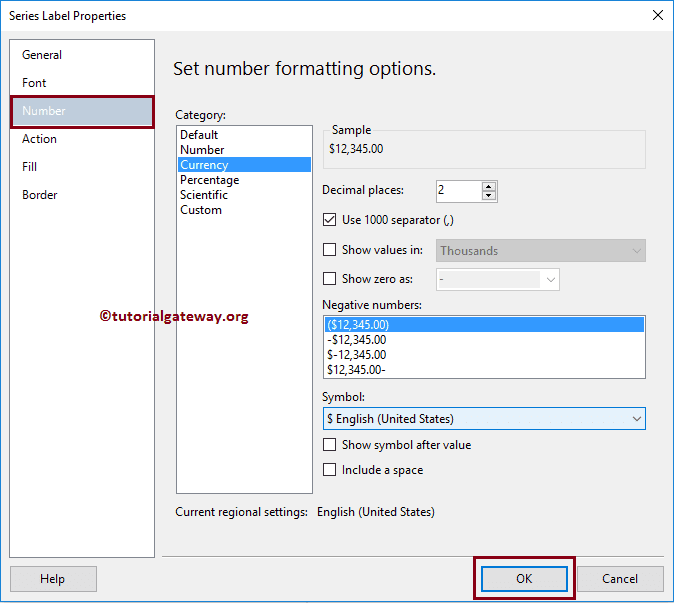 Please select the Series Properties from that context menu. 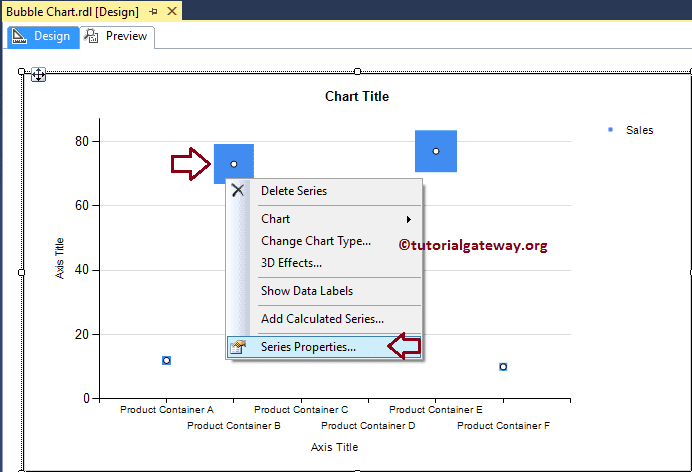 Once you click on the Series properties option, a new window called Series properties will be opened up as we shown below. 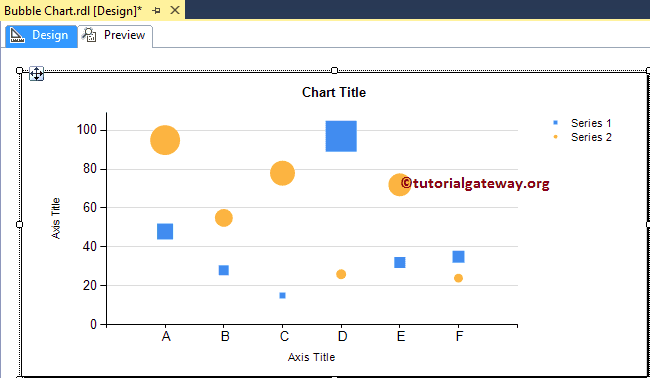 Right click on the Axis of a Bubble Chart, and select the Horizontal Axis Properties.. option from the context menu to format the Axis values. 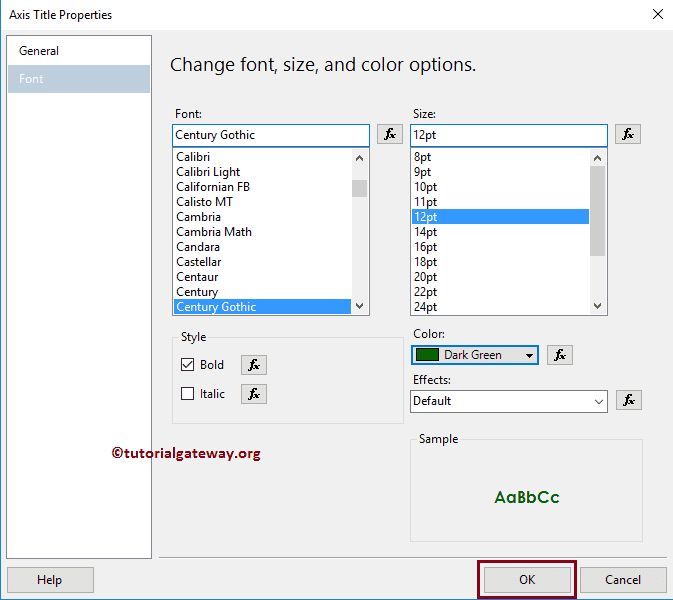 Here we changed the Font style to Century Gothic, Color to Dark Blue, Font Style to Bold, and font size to 9pt of the Horizontal Axis. 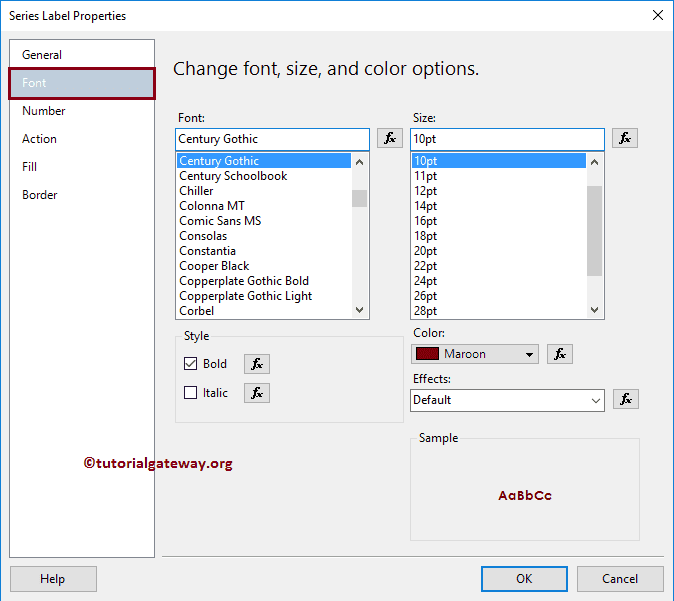 Please use the above specified technique to change the font of the vertical Axis. 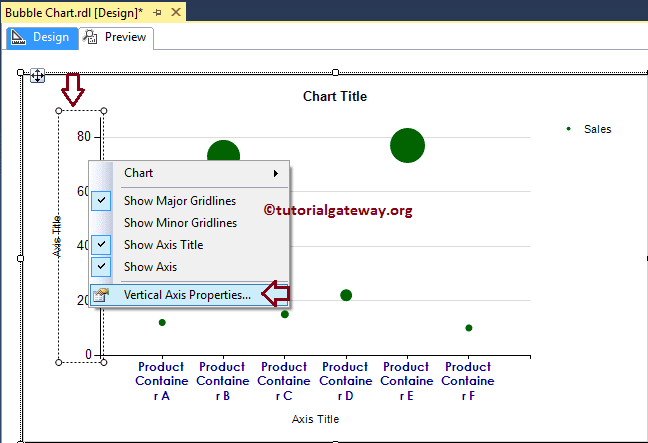 Next, format the Numbers in the vertical axis by selecting the Number tab. 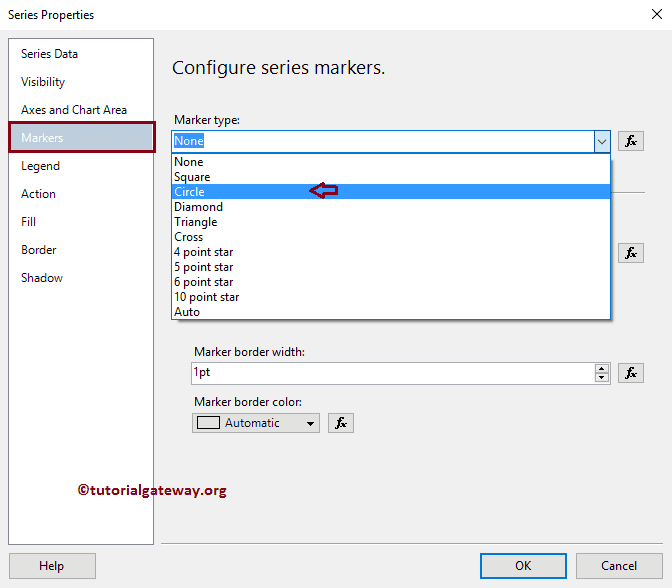 In order to change an Axis titles, Please select the Axis title region as we shown in below screenshot, and change the title as per your requirement. 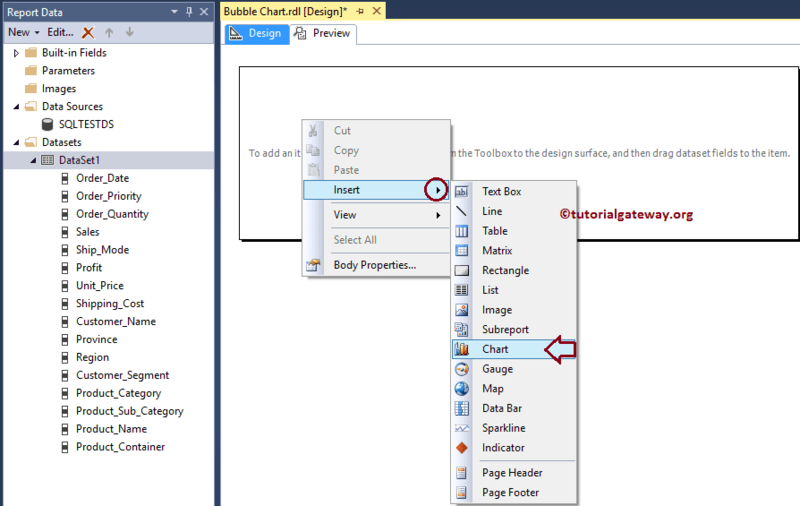 OR, right-click on it will open the context menu. 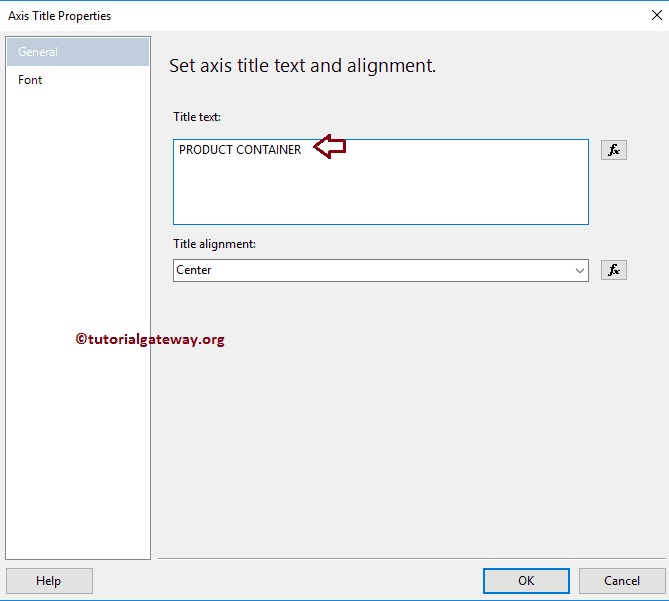 Please select the Axis Title properties.. option from the context menu as shown below. If you observe the above screenshot, It is providing perfect result but we are unable to identify the exact Sales. 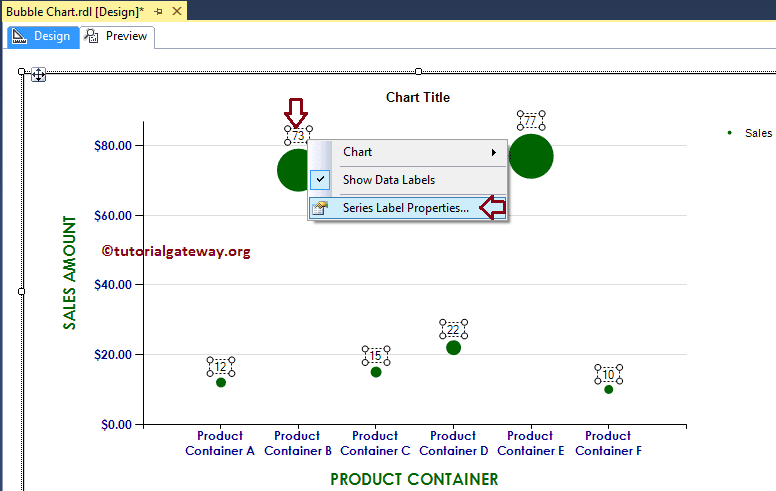 So, let us add the Data Labels. 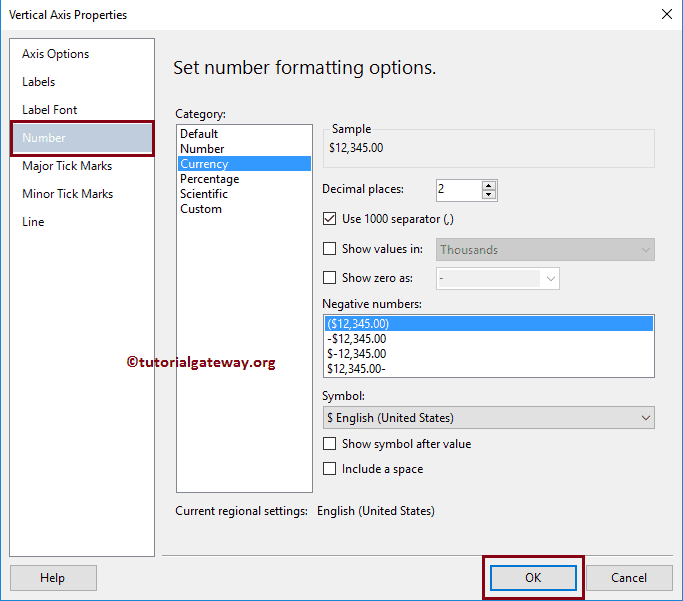 Next, format the Numbers to Currency by selecting the Number tab. 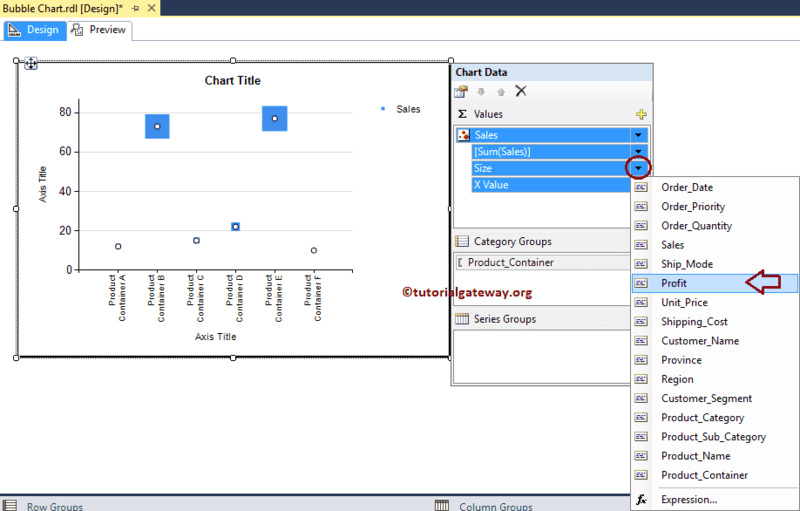 To change the title of a bubble chart in SSRS, Please select the Chart title region as we shown in below screenshot, and change the title as per your requirement. 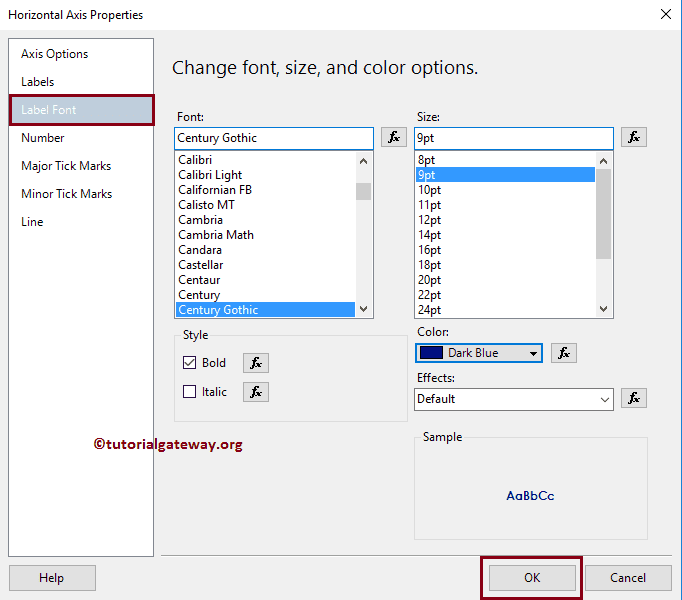 OR, right-click on it will opens the menu. 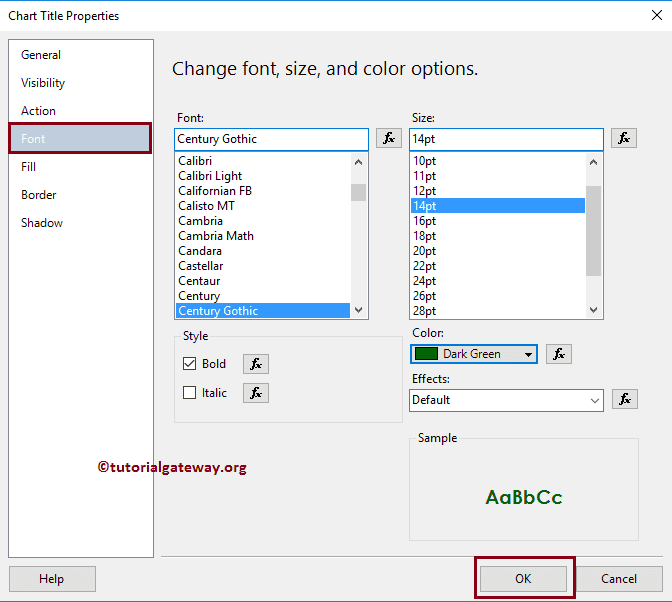 Please select the Title properties.. option from the context menu as shown below. 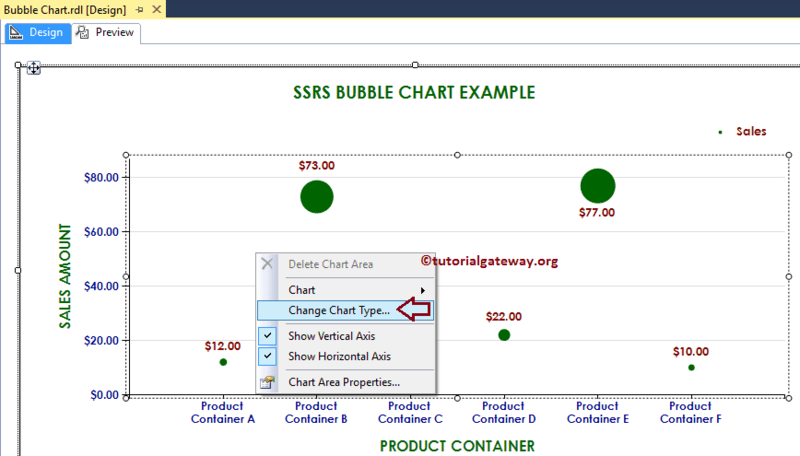 To format the SSRS Bubble Chart Legend region, Please Select the Legend region and right-click on it will open context menu. From the menu, please select the Legend Properties option. This will open a new window called the Legend Properties Window. 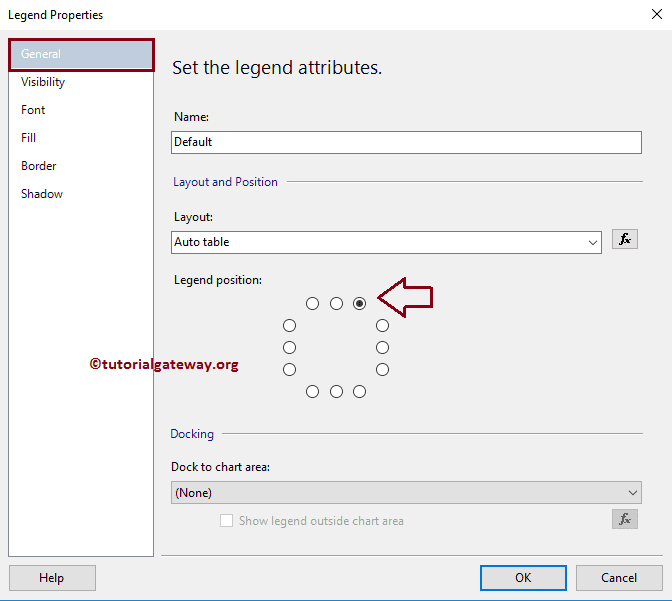 Within the General Tab, we have an option called Legend Position to change the Legend Position by changing the dot positions. For now, we are changing the position to the top right corner.